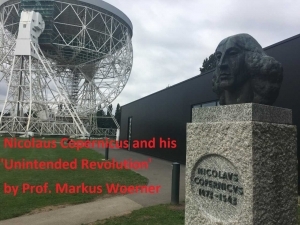 Talk: Nicolaus Copernicus (1473-1543) is frequently regarded as the founder of modern astronomy in the attempt to prove that the Sun and the planets did not revolve around a static Earth. Following views of ancient Greek astronomers dating at least as far back as Aristarchus of Samos (b. 310 BC) but not considered systematically for centuries thereafter, because they appeared to contradict sense experience and traditional thought, Copernicus maintained an (almost) sun-centred theory of the planetary system and the universe. In the attempt to re-work and improve Ptolemy’s geocentric theory of the Almagest (ca. 150 AD), transforming it into a heliocentric one by using improved and more sophisticated data and methods, he certainly did not wish to start a scientific revolution, with huge implications not only for astronomy but for physics and religious belief. He was a hesitant conservative instead. However, almost by necessity drastic changes of our view of the world and our place in it followed his predominantly geometrical considerations. Our world was not the same as it used to be. The talk will present a rough outline of some of the major traditional astronomical problems which he attempted to solve and explain their theoretical and practical consequences. Speaker: Markus Woerner is an amateur astronomer, Emeritus Professor of Philosophy of NUI, Galway, and Fellow of the Royal Astronomical Society. He is co-founder of the Galway Astronomy Club.